A Cake Bakes in Brooklyn: Go, JIffy Mix! 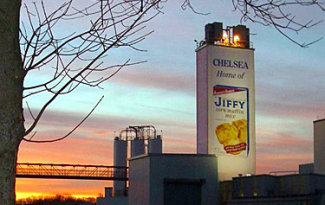 We LOVE Jiffy! We took our kids to the factory for a tour. It was beyond cool. My grandfather only used Jiffy mix to make pancakes and waffles. Every time we had them, he always told us that we were "supporting our family cemetary", which sounds bizarre, but even though no one from the family lives in Chelsea, Jiffy is there and supporting the community. It's just a great company - thanks for posting about them! My mother in law swore by Jiffy.And though I wouldn't buy anything with artificial blueberries I'd say more power to them.I do believe they make hot roll mix that many use for pizza crust.In any case I think there are those of us who bake and others don't for a variety of reasons. But a company that tries to do the right thing gets an At in my book. And yes I am all for fewer laws. Socialism is not for me! Don't start me ranting! Thank you for sharing this. Box mixes aren't something I ordinarily purchase for my own use but, if I do, I will make sure future purchases are Jiffy. And I will definitely add Jiffy mixes to my list for food pantry donations. Hi Susan! Greetings from San Francisco California. I am a first time visitor. What an awesome blog. The Jiffy subject is a great one. Great photos. Fascinating information. Thought provoking. And a touch of nostalgia. Bravo! I also write a blog about food but with my thoughts on relationships, family and friends. Please visit. Maybe follow. That would be cool. What a breath of fresh air! Not many companies like that left are there? Thanks for the great article, it has inspired me to use their products more. No question, we have camsex no Grand Bargain, blah blah. Let's talk about the speakers, shall we? So while we warned that this feature might not be endemic to the entire production run -- and even though Android is data intensive, we found that the buttons are perfectly usable. Nice blog about a family owned company. . . which is rare these days. I like to make my blueberry muffins with a box of jiffy cornbread and box of yellow or lemon cake mix and lots of blueberries!! I will remain loyal to this brand even when there are other options, jut for the family owned info. I'm a baker, but I cop to keeping Jiffy cornbread on hand for those times when I need cornbread in a jiffy. And I too have a couple family heirloom recipes that call for their mix. So I have a longstanding love for the company anyway, but reading about the corporate philosophy makes me actually glad to support them. That factoid about the salaries they pay warmed my heart like a steaming bowl of corn casserole. I grew up in Ann Arbor, which is in the same county as Chelsea, MI where the factory is located. It is indeed a great local business. Even today, many years later, I am never without Jiffy Corn Muffin Mix in my cupboard. I bake everything else from scratch, but those corn muffins taste like home. This is an inspiring story about a local business that has stayed local, even after becoming very popular in the US. It treats its workers with respect and is honest about the product that it sells. This is a story that other businesspeople can look to and learn from on how to treat their business and their employees. If you're looking for a good opportunity at Jiffy (or elsewhere), I would highly recommend using http://www.granted.com, as there are more than 2 million job openings on the site, and it is free to use.